Back in the early days of QUEST, when we were first piloting the Your Photos on QUEST segments, Steven Christenson was one of the first photographers to respond to our call for submissions, posting on the QUEST YPOQ Flickr page his set of photos from Mission Peak Preserve near Fremont, California. When I was trolling for our first YPOQ photographer for the new season of QUEST TV, I went back to some of those early submissions and was immediately struck by Christenson’s set of vibrant, kinetic images, especially his night sky photographs and star circles. Not only are they totally unique and beautiful, there’s obviously a good story to be told in how he actually makes them. Shooting photographs in very low light is a special skill, one that Christenson has honed to a fine art over the last few years. In fact, he’s gotten so good at it, he was honored as one of the winners of the International Astronomy Photographer of the Year, 2010 awards in the “People and Space” category. 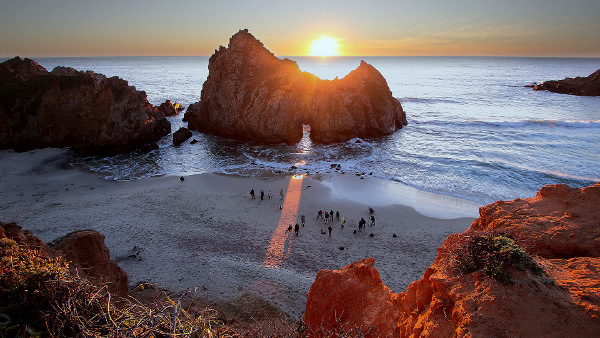 Here’s his winning photo, taken at Pfeiffer Beach in Big Sur, California. He shot it as people gathered on the beach during one of the few days each year when the setting sun shines directly through the archway of a large rock formation. Indeed the process of “finding light in the darkness”, as Christenson puts it, is more involved than one might imagine. First off, you have to get to a place that has a good vantage point on the stars. In Christenson’s case, this usually involves driving and/ or hiking a good distance before he even sets down the tripod. Then, you have to deal with the notoriously foggy/ rainy/ cold Bay Area weather. He’s been battling with the weather at Pigeon Point Light House State Historic Park in Pescadero for years. But he’s managed to get some spectacular images there nonetheless. Once all the stars align so to speak, and Christenson has set up his shot, the waiting begins. As the earth rotates and orbits the sun, the stars appear to travel through the sky and his camera is set to take an image at set intervals. It can take all night for him to get the images he needs to stitch together his final images. He often sleeps in his car or out under the open sky if weather permits. For our shoot with Christenson, he took us hiking up Mission Peak, his favorite location in the Bay Area to shoot. Between our audio tech, Helen, associate producer Josh and myself, we’ve collectively lived in the Bay Area for more than half a century and none of us had ever been to Mission Peak. It’s absolutely spectacular up there. It’s one of the things I love most about this job that I have the opportunity to see and experience things that have been under my nose for years but have never noticed. 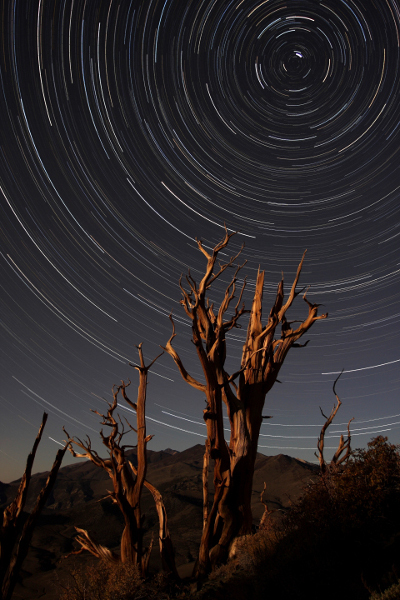 And if you’d like to join Steven Christenson for a nighttime photography tour of Mission Peak or several other Bay Area locations, be sure to check out the Star Circle Academy website. Thanks so much for the great fun I had shooting this with ya’ll. Please note that Mission Peak has recently changed their hours. See the site: http://ebparks.org/parks/mission for details, maps and other information.